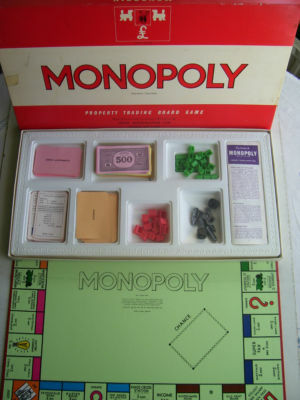 MONOPOLY is the classic property trading board game.Invented in America during the Great Depression, its the game about dealing in big money and getting rich quick. Starting from the famous ''GO'' space, move around the board, buying and selling properties, building houses and hotels as you go. Watch out for players landing on your property- they owe you rent! And don't forget to collect £200 every time you pass ''GO''! Your success depends on wise speculation, smart investments and clever deals. Even if your luck fails, you can still resort to mortgages and deals with other players. If you become the wealthiest player with so much money that YOU OWN it all---YOU WIN MONOPOLY!! !